1.The client application makes a request, which is passed to a middle tier (such as the JDBC Thin driver, Universal Connection Pool, or WebLogic Server or third party pool) or directly to the database using the JDBC replay driver. 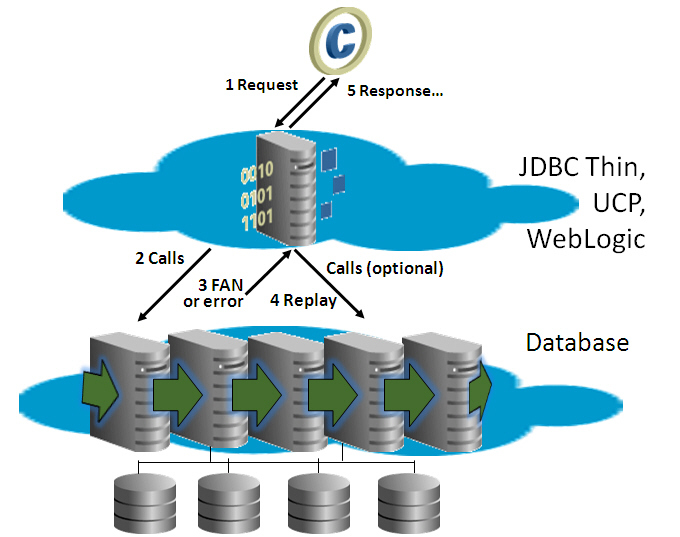 2.The JDBC replay driver issues each call in the request. 3.A FAN unplanned or planned down interrupt or recoverable error occurs. FAN/FCF then aborts the dead physical session. 1.Replaces the dead physical session with a new clean session and rewires FAN in case a later error occurs during or after replay. 2.Prepares for replay by using Transaction Guard to determine the outcome of the in-flight transaction if one was open. 3.Optionally, calls back using a labeling callback or reconnect callback for the initial state. 4.Rebuilds the database session, recovering the transactional and nontransactional states, and validating at each step that the data and messages seen by the client driver are the same as those that the client may have seen and used to make a decision. 5.Ends the replay and returns to runtime mode. 6.Submits the last queued call. This is the last call made when the outage was discovered. During replay, only this call can execute a COMMIT. A COMMIT midway through rebuilding the session aborts replay (excluding autonomous transactions). 5.The response is returned to the application. 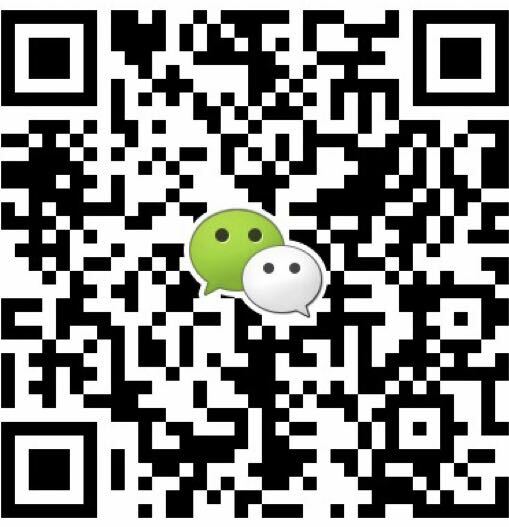 If replay succeeded, the application can continue with the problem masked. If not, the application must handle the original error. 1.If you use Oracle Real Application Clusters or an Active Data Guard farm, after the connection instance is reestablished on another running instance, Application Continuity attempts to rebuild the session and replay the last transaction if there is one in flight. 3.If you are using Oracle RAC or Oracle RAC One and not using Data Guard, and if an outage causes a break in all public networks or causes the database or database session to shut down briefly, Application Continuity attempts to rebuild the session and replay the last transaction (if a transaction was in flight) against the database after connectivity is restored. 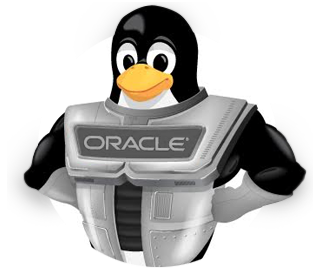 Use Oracle Database Release 12.1 or later. Use an application service for all database work. Create the service using srvctl if using RAC or DBMS_SERVICE if not using RAC. You may also use gdsctl. Tablespace changes for table or partition, index, and LOB columns. Compression type changes for table or partition, index key, and LOB columns. STORE AS SECUREFILE or BASICFILE for LOB columns. 支持更多的数据类型，Data types include XMLType stored as binary XML, XMLType stored in object-relational format, objects and collections, Database File System (DBFS), XDB, Oracle Spatial and Graph, Oracle Text, Oracle Multimedia, Label Security, and Oracle SecureFiles (deduplication and fragment operations). Initializes a rolling operation plan with system-generated default values. Destroys any existing rolling operation plan, its parameters, and all resources associated with the rolling operation. Validates plan parameters and creates or modifies a rolling operation plan. Modifies a rolling operation parameter. Performs a switchover between the current primary database and the transient logical standby database. Completely rolls back the rolling operation. EDS supports SDO_GEOMETRY, XMLType stored in object-relational format, XMLType stored as binary XML, objects, and objects with varray columns. Database is crash-consistent at the point of the snapshot.